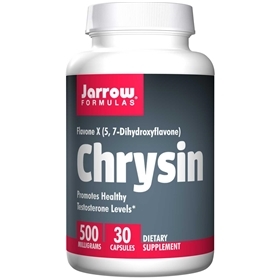 Chrysin (5,7-Dihydroxyflavone)is a bioflavonoidfound in passion flower (Passiflora coerula), thatpromotes healthy testosterone levels by inhibiting aromatase, the enzyme that converts testosterone to estrogen. Chrysin has the ability to act as an inhibitor in the aromatization of androstenedione and testosterone to estrogen and estradiol. It accomplishes this by competitively binding with the enzyme responsible for catalyzing the conversion of the hormones. The net result is to naturally increase levels of testosterone in the body. Chrysin is a flavonoid that occurs naturally in plants such as the passionflower, silver linden, some geranium species and in honey and bee propolis. Athletes are interested in Chrysin for bodybuilding due to its potential effect on testosterone levels. It also has several potential anticancer properties. Chrysin seems to increase glucuronidation, which might reduce the bioavailability of dietary carcinogens. Silicon dioxide, cellulose and magnesium stearate (vegetable source). Capsule consists of gelatin. No wheat, no gluten, no soybeans, no dairy, no egg, no fish/shellfish, no peanuts/tree nuts.